Yesterday I was fully immersed in restaurant history. Starting off the day I had an e-mail exchange with a local 1970s activist about a feminist restaurant that once operated in Northampton MA. Next I had an interesting phone call from a researcher in Minneapolis who has unearthed the early 20th-century history of Greek immigrant restaurant and confectionery proprietors in Sioux Falls, South Dakota. Then, while surfing a Facebook page about my former hometown of Webster Groves, Missouri, I discovered a discussion about a long gone restaurant there that refused to serve Afro-Americans. The name of the restaurant was the Toll House. I never went inside but as a child I formed the impression that it was a place where old-line Webster Grovesians went to eat club sandwiches and fruit cocktail appetizers on the nights their maids were off. Since Webster Groves was a dry town then, it was a restaurant that my parents would never have chosen – no Manhattans! 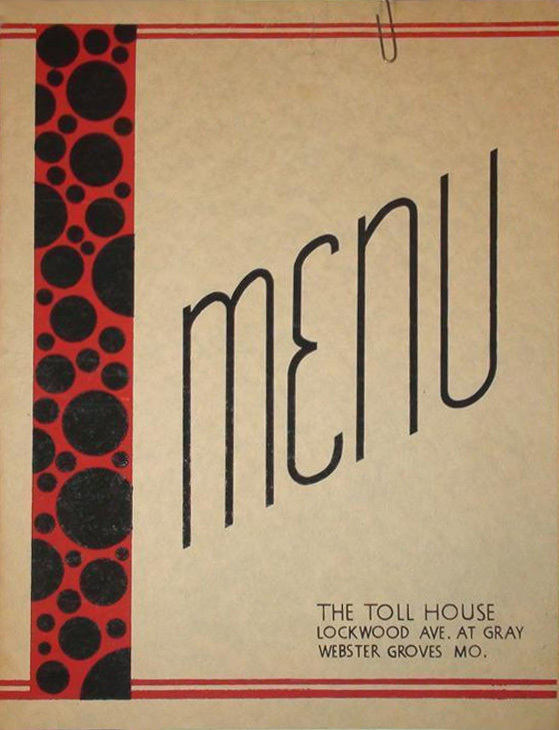 An undated menu reveals that the Toll House had some surprisingly (to me) upscale dishes considering its rather drab appearance and its location in a dry, Waspy suburb of St. Louis – Oysters Rockefeller (.75), Pompano (.85), Lobster (1.25), Chateaubriand (1.35), and Baked Alaska (.40). The Toll House was the site of pickets and sit-ins against racial discrimination in 1961 and 1962. Sadly, the city of Webster Groves seemed all too ready to arrest protestors. Just how many protests took place there is unclear, but I have found evidence of at least four. In the summer of 1961, two women picketers were arrested outside the restaurant after the proprietor Myrtle Eales, who ran the restaurant with her husband Forrest, claimed they had pushed her in a scuffle. In January of 1962 thirteen black and white members of the Congress of Racial Equality (CORE) were arrested for trespassing after they occupied the restaurant for four hours without being served. Although it was a cold winter day, the owners turned the heat off and the air conditioning on in an attempt to get them to leave. That same month a group of four protestors were locked in the restaurant’s vestibule for two hours. Then in April of 1962 three white protestors, all airmen from an Illinois military base, were arrested by Webster Groves police on suspicion of being AWOL (they weren’t). The embattled restaurant did not survive the protests. I believe it closed in 1962. Strangely enough, the otherwise obscure Toll House had made the national news earlier when it was featured in a 1944 Life magazine article about (white) teen-age social life. 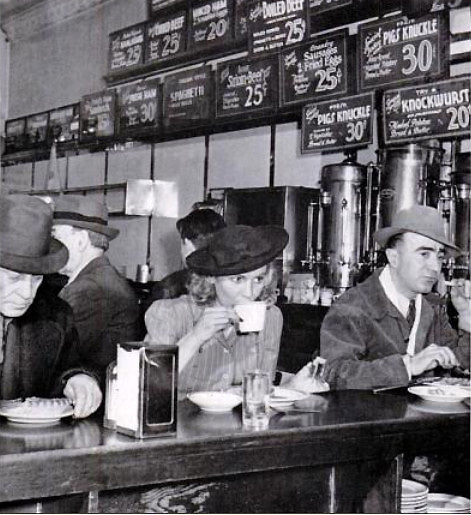 At that time it was a lunch counter popular with teens for hanging out. According to a letter sent to Life after the article appeared, whoever owned the restaurant then wanted young patrons to keep out. In a large advertisement in a local newspaper the management informed parents that their unruly children were bending silverware, breaking glasses, setting napkins on fire, carving up tabletops, and destroying stools. In 1966 the CBS documentary “Sixteen in Webster Groves” appeared, portraying the suburb’s teenagers as spoiled, conformist, and more concerned about having a nice house with gleaming silverware than with the Vietnam war or civil rights. Residents were unhappy with what they felt was a false portrayal but, I wonder, was it completely off base? “Next I had an interesting phone call from a researcher in Minneapolis who has unearthed the early 20th-century history of Greek immigrant restaurant and confectionery proprietors in Sioux Falls, South Dakota”. I do not know my Greek Heritage from Father’s side. The year was 1949 and I believe him to have worked in a Greek Restaurant in Sioux Falls, S.D. If the researcher has names of the restaurants/confectionery proprietors in existence in 1949 Who knows it just may lead me on a path to find him. I appreciate your help. Enjoy and think it’s great your digging into and cook’in up some great Restaurant history. Just discovered your blog via a search for The Maramor in Columbus, OH. You are a treasure trove!!! Can’t wait to spend more time on your site! Hi Martha, You are thinking of the famous Toll House in Massachusetts, which is the namesake of the cookie. No cookies at the Webster Groves Toll House.